“Christmas in Toyland” was the theme for this year’s Candy Cane Lane Parade in Visalia; and the Criminal Justice Corrections (CJC) program‘s float brought their Santa’s Workshop to life. Fifteen CJC students participated in building the SJVC float – its first ever entry in the parade, now in its 69th year. “We built it completely on Saturday, and was in the parade the following Monday night,” says Lathrop. 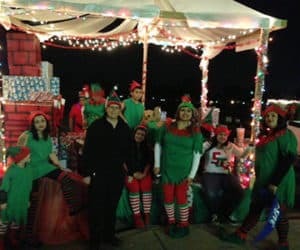 The Central Valley’s oldest nighttime parade began at 7:00 PM on December 1st and featured 107 floats and performances, such as marching bands, decorated vehicles and, of course, Santa and his helpers who tossed goodies from his huge bag. Visalia’s Main Street was packed with spectators, many of whom staked out prime viewing spots hours earlier and consider the Candy Cane Lane Parade the official kick-off to the Christmas season. The CJC program float was number 88 in line; and nine student participants, dressed as elves, enthusiastically demonstrated how Santa’s best helpers hammer, saw and nail some of the special gifts that find their way under the trees of children all over the world. Surrounding the elves were beautifully wrapped presents, ready for loading onto Santa’s sleigh. “Our students felt some school pride and had a good time doing this,” says Laura. “I’m proud of them and proud of the program,” she says. KFSN TV-30 in Fresno interviewed SJVC float participants, as first-year entrants, and ran a news story on their morning show. “We got a lot of good comments about how the float looked,” says Laura. Now, that is getting a jump on next year’s parade float plan. Previous postSJVC 'family' looks out for its own Next postWelcome to SJVC Shout Outs!